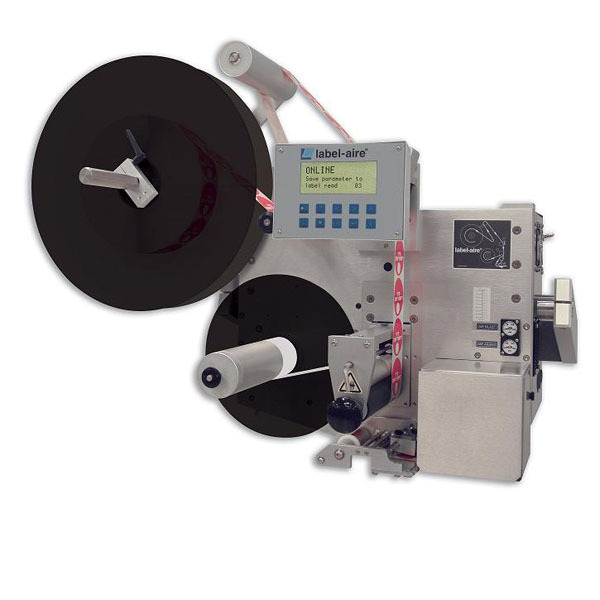 The Label-Aire Model 3111-NV was designed for high-speed air-blow labeling applications at a standard dispense speed of up to 1,500" (38.1 m) of web per minute or up to 2,000" (50.8 m) with the optional powered rewind. Advanced features include Velocity Compensation for improved label placement accuracy, a microprocessor controller with digital display, and ambidextrous parts. Zero Downtime Labeling allows your production to continue without costly interruptions. Missing label compensation virtually eliminates unlabeled products. Furthermore, the 3111-NV comes standard with a heavy duty double stack stepper motor-at no extra charge. The standard 7.13" (181 mm) wide applicator can be configured with a 4.13" (105 mm) wide or a 7.13" (181 mm) wide air grid. Not only can the 3111-NV be easily converted to left- or right-hand use, it can also apply labels to the top, side, or bottom of products with a label dispense accuracy of up to +/- 1/32" (.8 mm). Adding to the 3111-NV's versatility are the availability of tamp-blow and wipe-on conversion kits.